I installed this lift on my 1992 4 dr Explorer XLT. I had already been running 32 inch BFGÂ’s with my 2Â” Body Lift, but even with fender trimming I still had a little rub on the trails. I wanted more clearance, and I wanted to try a small suspension lift before I went with the Superlift 5.5Â” To this date, I have liked the lift a lot. It gave me the extra clearance I wanted and I can now run 33Â’s, maybe 34Â’s. Most of all it got rid of the soft stock suspension the explorer has and now when off-road I feel like I have a lot more control, though I do want to install a steering stabilizer. As you can see from the pictures it gave me a nice amount of lift, of course itÂ’s not as drastic because I didnÂ’t increase tire size. Be aware though that if you already have a body lift youÂ’ll want to install lift lips, which are not pictured. These are the actual instructions that James Duff includes with their lift kit, though it does not include the semi helpful diagram of your suspension and where the parts go. My comments will be in BOLD and the instructions will not be. Before you even bother reading this, be aware that it isnÂ’t easy. It took me the better part of two days with assistance and a garage with every power tool I could ever need. The most difficult part of the lift is the 8 rivets that you have to remove from throughout the suspension. They require an air hammer and/or radial compact grinder(I think thatÂ’s what it is called). There are two in each radius arm bracket and four in the left axle pivot bracket. 1. Measure and record vehicle height from axle to frame, next to rubber bump stop. Measure and record height at wheel opening, through center of wheel, from ground to fender, both sides. 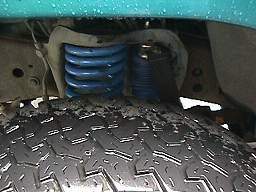 If vehicle is lower on one side, the round spring spacer shim should be installed with the lift to level the low side. I think they include this step for the Rangers and Bronco IIÂ’sÂ…I didnÂ’t need it. 2. Jack up vehicle using floor jack under I-beam, place safety stands under frame and remove wheels and tires. 3. 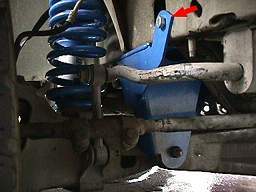 On vehicles with a front mounted sway bar, disconnect bottom end of sway bar lower links with 18mm wrench and push them up out of the way. 4. 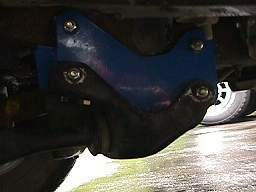 To keep from damaging the brake lines, disconnect caliper from mounting bracket and tie caliper out of the way. 5. Using floor jack under I-beam, raise to remove load from shock and remove shock. Next, note how the spring is seated so you can position the new one correctly. Lower jack to remove weight on coil spring and disconnect the large(1 1/8Â”) nut and washer that hold the lower portion of the coil to the axle and remove the spring. 6. If needed, insert spring spacer shim over the lower bolt on the low side of the vehicle(as shown in the diagram). Install the new coil, being sure to seat it exactly as the original coil in the top of the spring tower. Place the urethane spring seats over the top of the lower bolt and replace the lower nut and washer, making sure the coil is centered on the centering cup, then reattach the caliper to the mounting bracket. 7. Repeat steps 4,5, and 6 for the other side. This is all pretty easy, though I installed all the drop brackets before installing the springs. They are easy to get in once the axle has been lowered. YouÂ’ll also notice I have limiting straps. 8. 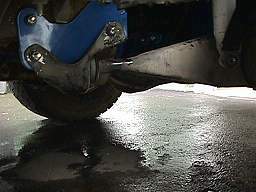 To remove the right axle pivot bracket, located under the battery, place the floor jack under the center of the left I-beam. Raise jack until contact is made and remove the right axle pivot bolt. Lower jack carefully until the bracket and I-beam are approximately 4Â” apart. You may have to pry to separate the I-beam and drop bracket. Unbolt the factory bracket and bolt the new drop pivot bracket into position using the original bolts. On some models, you will have to drill a ½Â” hole through the frame rail before you can finish bolting on the new bracket. In this case it helps to drill a ¼Â” pilot hole first using the bracket as a guide. Use the ½Â” x 1 ½Â” gr 5 bolt and nut in this position. Re-align the I-beam with the new drop pivot bracket and reconnect the original axle pivot bolt. I actually installed the radius arm brackets first. Having the radius arms free to move around while I was trying to install the axle pivots saved me a lot of time. For my 92Â’ I did have to drill the hole they talk about, which I highlighted with a red arrow. 9. 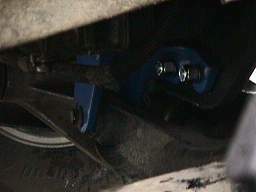 To remove the left axle pivot bracket, located on back of engine crossmember, reposition floor jack under right I-beam. Unbolt left axle pivot bolt and pry the I-beam down away from the drop bracket. Grind away the heads of the rivets holding the drop bracket to the crossmember and drive out the shanks. Bolt the new cast iron drop bracket in place through the rivet holes using the black ½Â” x 1 ¾Â” bolts. Re-align I-beam with drop bracket and reconnect with original axle pivot bolt. A line-up pin or center punch may help to accomplish this. This part isnÂ’t fun, it has four rivets all of which we had to grind and mustÂ’ve an hour or so. The picture is up close, and if you want to see more the picture of the left radius arm drop bracket shows it again. 10. Remove the radius arm bushing retaining nuts from both sides. Loosen the bolts that tie the radius arm mounting brackets together at the center. Then torch or chisel off the rivets on the radius arm mounting brackets, and lower them together. To install #6103 bushing, just remove the mounting brackets from the radius arms, install front bushings and reinstall mounting brackets. Place the new powder coated radius arm drop brackets between the frame and the radius arm mounting brackets. Secure in place with the 7/16Â” and ½Â” bolts and nyloc nuts. Reinstall the radius arm bushing retaining nuts and torque to specification. Again the rivets arenÂ’t easy, I used an air hammer, and it took one hour per side. The first picture is of the passenger bracket, the second is of the driver. Also, watch James Duffs Web site, last time I talked to a salesperson and he mentioned they are working on longer radius arms in place of the drop bracket, and theyÂ’re also working on improved steering( longer pitman arm). Superlift offers them too, so if you want 4Â” and up go with them. 11. Replace the shocks and reattach calipers to caliper mounting brackets. Recheck brake lines after installation, as they may need adjustment to keep from rubbing the wheels or coils. Reconnect the lower sway bar links, if necessary. 12. Reinstall wheels and tires while watching carefully the position of the brake lines. Adjust the as necessary to clear the coils and the wheels and tires. Remove the floor jack and check again. Complete the rear of the vehicle, then set toe-in. 1. Raise the rear of the vehicle and place on frame jacks, allowing the axle to hang free. Leave the jack under the housing to prevent over stressing the brake lines. 2. Remove the wheels and tires. Remove the stock shocks and U-bolts. Lower the axle housing assembly away from the spring pack one side at a time. If installing add-a-leafs, clamp the leaves that are longer than the new add add-a-leaf together, then remove the center bolt. 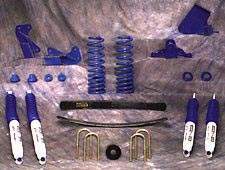 Install the leaf in order of length and install the new center bolt in the spring pack. The rear isnÂ’t to bad, but I do recommend removing a trailer hitch if you have one, and the spare tire. It helps you to have more room to move everything around and it give you a good time to paint that nasty trailer hitch and was that mud covered spare. This is a picture of the shackles. (Insert Picture # 9). 3. Install the new U-bolts and tighten them alternately to 70-80 ft.lbs. 4. 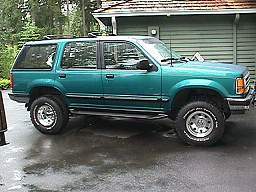 Replace the shocks, and reinstall the wheels and tires. Remove jack and lower vehicle. James Duff includes instructions on steering alignment, but you should have it done professionally, which means someone who actually has aligned an explorer and/or lifted vehicle before. You may need new camber bushings after the lift, I needed one. 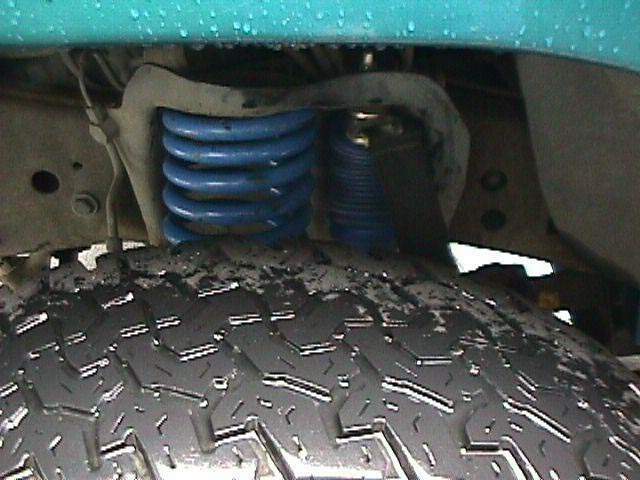 Setting Toe-In: This is necessary for safe driving and to avoid front end damage. 1. Using a floor jack, and with the front wheels barely off the ground, set a light colored can of spray paint on the floor in front of one of the tires. Spin the tire and depress the button of the spray can, spraying a strip on the tire all around the circumference. Then do the other tie. 2. Take a board with a nail hammered through it, set it on the ground to the nail can scribe a line through the paint as you spin the tire. Do both tires. 3. Lower the front end to the ground, and with the help of a friend measure the distance from one scribe line across to the other tire, on both the front and the rear of the front tires. 4. The front measurement should be 1/8Â” less than the rear measurement. That is proper toe-in. 5. To adjust the toe-in loosed the sleeve on the end of the tie rod and drag link near the wheel with a 15mm wrench. Then turn the sleeve with channel lock or water pump pliers. Adjust the sleeve the same number of turns. Re-check until you reach the 1/8Â” difference. Then tighten the sleeves back up with the 15mm wrench. 6. Drive directly to the alignment shop and have the caster, camber and toe-in checked and aligned as necessary. Total lift is no achieved until after alignment is done. NOTE: After 50 miles and 100 miles of driving and after the first week, all nuts and bolts should be checked. Any vibration of the driveline should not be ignored, but thoroughly checked out. Whether you're lifting, leveling, or lowering AmericanTrucks has the parts to adjust your Ford F150 suspension to the height you want.